From early in the American Civil War songs began to emerge focusing on aspects of the Irish experience of the conflict. Many of these tunes remain familiar to us today, but beyond their often rousing lyrics, what were they originally intended to convey? To explore this further I am delighted to welcome a guest post from an expert in the area, friend of the site Catherine Bateson of the University of Edinburgh. Catherine is one of a number of scholars undertaking research into the Irish and other diasporas at Edinburgh; it is also the home of Professor Enda Delaney, author of the important paper Directions in Historiography: Our Island Story? Towards a Transnational History of Late Modern Ireland which has been referenced a number of times on this site, and is a must read for anyone interested in why subjects such as Irish involvement in the American Civil War are not major topics of study in Ireland. * Catherine is engaged in PhD research under the supervision of Professor Delaney, on the topic of American Civil War Songs and Irish American Sentiments. She has kindly agreed to share some of her initial findings with us– it may be that some readers have information that will assist Catherine in this important research. So begins The Gallant Sons of Erin, a ballad dedicated to the 69th New York Infantry. 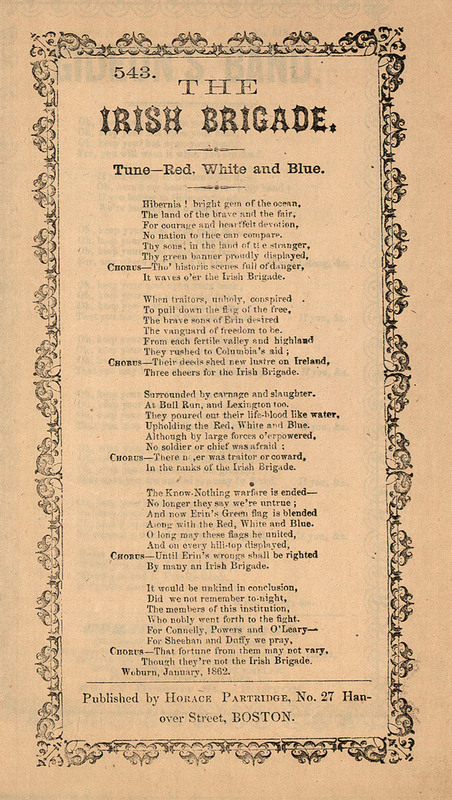 It is one of several 69th New York-related songs which comprise an ever-growing collection of song sheets written, produced and circulated by and about the Irish who fought in the American Civil War. The approximately 100 songs I have found and started researching form the foundation of my doctoral research at the University of Edinburgh, which focuses on the sentiments expressed in Irish-related songs from the Civil War and how these ballads, lyrics and the music used to sing them form part of an Irish cultural diaspora in mid-nineteenth century America. They reveal what the war meant to the Irish involved and the impact participation had on the relationship between Irish, American and, ultimately, Irish American identity in the 1860s. While interning with the British Library’s American collection to produce an online gallery exhibition about Britain and the American Civil War, I came across a beautiful songster scrapbook – a collection of song sheets printed during the Civil War that sing the story of the conflict. This included two dozen or so songs referring to Irish involvement in the war. I spent much time trying to work out the contradictory sentiments they expressed: lyrics were simultaneously pro-Union/nationalist and anti-secessionist, extolling Irish and American patriotism (by which I mean two distinctive identities, not ‘Irish-American’), and demonstrated a will to fight, even songs written in 1862/1863 when the war sacrifice of Irishmen started to have an impact within military and civilian circles. Such sentiments connect to the second part of my doctoral research: how Irish Civil War songs and the music their lyrics were often set to reveal the maintenance of an Irish cultural diaspora in mid-nineteenth century American culture. In essence, I’m trying to establish two histories: the first of the songs themselves, ie. the lyrics sung, and the second being the history of Irish music dissemination in America, ie. the tunes. This is not just ethnic-Irish related. Several of the songs I look at are set to Scottish, Scots-Irish and American (English) tunes, so I also evaluate the way in with Irish music became American in much the same way Irish soldiers were said to become Americanized during the war. (8) This side of my research extends beyond songs pertaining to the Irish experience. One of the main sources I’ve been focusing on is the Confederate rallying song The Bonnie Blue Flag – a (Confederate) American song, written by a songwriter of Scots-Irish descent, Harry Macarthy, and set to the tune of the Irish ballad The Irish Jaunting Car. The song spread around America, North and South, carrying with in an Irish tune that would have been identified as American. Trying to determine why Macarthy, with his own intriguing ethnic-Irish connections to this song, used The Irish Jaunting Car tune for his Bonnie Blue Flag provides an example of the research I’m conducting into the authors of many of these musical pieces connected to the Irish in the war. Tying the two strands of my research together is the dissemination of these songs throughout Irish and American military and civilian communities. Letters such as Patrick Kelly’s, which Damian has displayed on this site, provide excellent examples of the way in which soldiers communicated musical practices and sharing with the home-front. (9) Such examples, amidst the thousands of pages of correspondence and memoirs, are not that common: music and song singing was so universal in the nineteenth century that, ironically for such a noisy topic, it does not appear regularly in primary sources. Michael Corcoran’s memoir and letters have become personal favourites, as he writes about the daily activity of song composition while in Confederate captivity. (10) The task of finding soldiers and civilians talking about this subject is almost beyond the scope of my studies (for now). Thus I’d like to gather all the readers of this blog site and those interested in the role of the Irish in the American Civil War to keep their eyes peeled for any music/song references in primary sources, be they Irish-related or from others speaking about Irish culture. I have more than enough songs to be occupying my research needs at present, but any sources like Kelly’s would be gratefully received if passed on. Hopefully I’ll be able to update you all soon with more of my research findings and arguments! You can follow the progress of this via my Twitter – from time to time I quote some of the best and most amusing lyrics I find, as well as lines relating to certain key anniversaries of Irish military involvement in the conflict. If anything, my research is already recalling a forgotten voice and unique articulation of sentiments about immigration, nationhood, patriotism and identity that has been unheard for one hundred and fifty years, revealing that the whole scope of the Irish experience of the American Civil War can be read and heard in these songs. *For those interested in reading Professor Delaney’s paper, you can find it in Irish Historical Studies 148, November 2011. (1) A mini-dissertation spoiler: every lyric I’ve come across strongly supports the suggestion this process of ‘becoming American’ was happening during the war. The songs are an intriguing way in which this was articulated – but I’ll save that for another blog post further along in my research. (2) On this issue I’m also looking at how Welsh, Scottish and German soldiers in the Civil War engaged with this practice and cultivated their own ethnic music cultural diasporas during the conflict in comparison to the Irish. (3) The Captivity of General Corcoran, p. 30. (4) Glorious 69th, British Library, http://www.bl.uk/onlinegallery/onlineex/uscivilwar/highlights/songsters/glorious69th.html. 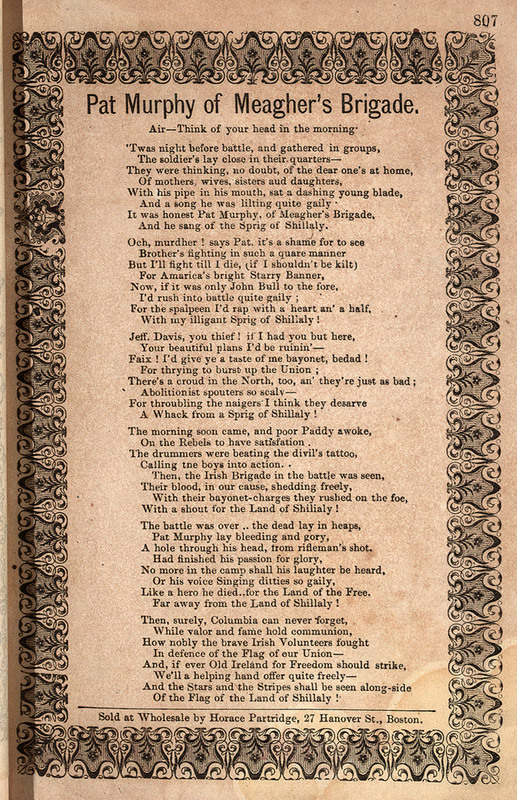 (5) The Irish Brigade, British Library, http://www.bl.uk/onlinegallery/onlineex/uscivilwar/highlights/songsters/theirishbrigade.html. (6) Being a cultural/social historian of the American Civil War before I started by PhD meant I used to gloss over regimental structures and numbers and battle details – I’m happy to say I’ve quickly learned they actually do matter! (7) I must add the small qualification here that I haven’t really begun researching the Irish in the Confederacy in much detail yet – that’s my priority for the next stage of my PhD research. (8) Battle of Bull-Run – dedicated to the 69th Regiment, N.Y.S.M., R.L. Wright Irish Emigrant Ballads and Songs (1975), p. 447. (9) Pat Murphy of Meagher’s Brigade, published by Horace Partridge, Boston, British Library, http://www.bl.uk/onlinegallery/onlineex/uscivilwar/highlights/songsters/patmurphyofmeaghers.html. The song has several title variations, including Pat Murphy of the Irish Brigade. 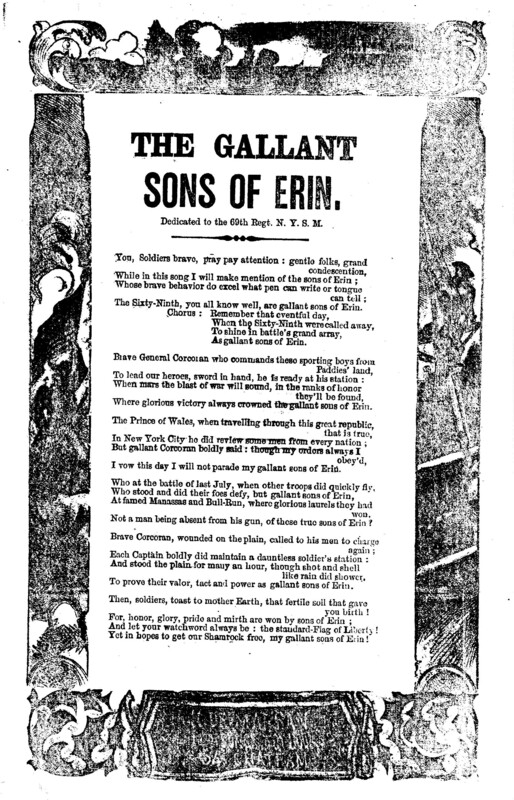 (10) The Gallant Sons of Erin, Library of Congress, http://www.loc.gov/item/amss003406/. The song sheet used to quote from this song actually dedicates the ballad to the 69th New York State Militia, but the lyrics and stories the verses sing relate to the infantry regiment. Fascinating. Look forward to reading more. Many thanks for the comment- I have David’s albums, would love to get the opportunity to see him ‘in the flesh’ someday! Thanks Thom! Catherine is doing some fantastic research in this area!